#FindingDory – Review Repost – In Stores Now!!! One year after Dory and Marlin ran into each other, Dory is happy and living next to Nemo and Marlin. Then Dory sees and hears things that jogs her memory about her childhood. She decided to go on a quest to find her parents, much to Marlin’s chagrin. But Marlin understands what it’s like to love, lose, and miss someone, so he (along with Nemo) accompany Dory on her journey and to keep her on track. 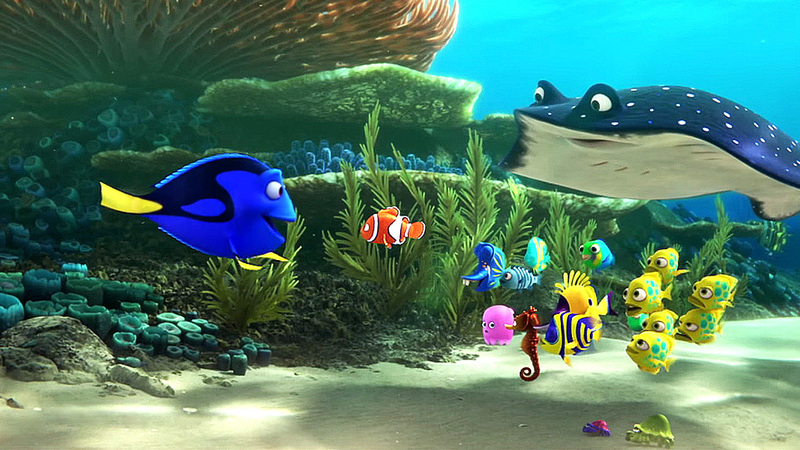 It’s not long before Dory gets separate from Marlin and Nemo. Dory ends up looking for her parents at the Marina Life Institute. And Marlin and Nemo end up looking for Dory. This adventure of close calls, new and old friends, and bravery answers the questions about Dory’s song “Just Keep Swimming”, how she learned whale, what happened to her parents. This is an adventure you won’t forget to remember. This movie starts in a very unique way. It starts with little Dory, who loses her parents, searches for her parents, and then slowly forget what she was looking for as she gets older. Then, the 1st time she runs into Marlin, which is a classic scene from Finding Nemo (FTC Affiliate Disclaimer). Next the movie jumps to 1 year later to bring it to present day. Please note, that your children (or you) do not need to see the first movie to understand this one. You will laugh, get sad, and learn something. It answers questions you have and even answers questions you never thought to ask. It’s a beautifully done sequel. The intro has a “Thank You” from the director and a wordless short called Piper. The short movie is very entertaining and a good kick start to Finding Dory. The end credits lead to a game that should be called “Finding Hank”. Finding Dory also offers a 1st person perspective through some of the more action packed sequences. This perspective puts you in Dory’s fins and makes you are part of the action. This movie is a must but not necessarily in 3D.